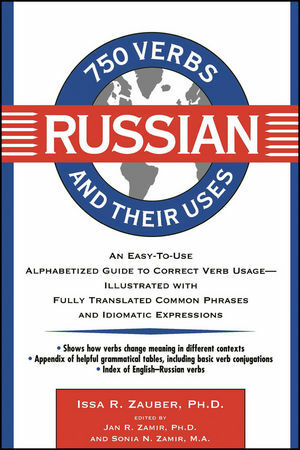 750 Russian Verbs and Their Uses gives you the key to a livinglanguage--verbs in context. Verbs give speech power and movement. Russian verbs have subtletiesthat usually can be appreciated only after years of study andconversation with native speakers. 750 Russian Verbs and Their Usesgives you all the correct variations and adds immediately to yourcommand of the language. Correct usages are illustrated in common phrases and idioms, andclose attention is paid to verb aspect--a special concern tostudents of Russian. Perfect for students or for businesspeople who are working todevelop one of the world's most exciting commercial markets, hereis the book that will help you understand and express yourself inan important and intricate tongue. Also available in the series: 750 German Verbs and Their Uses, 750Spanish Verbs and Their Uses, and 750 French Verbs and Their Uses. ISSA R. ZAUBER, Ph.D., holds a doctorate in linguistics fromLeningrad State University. She is currently a senior lecturer inthe Department of Slavic Studies at the University ofChicago. Series Editors: Jan R. Zamir, Ph.D., and Sonia N. Zamir, M.A.